Many runners find that a good pair of shoes and a good watch are their constant companions. There is a lot of information on picking those good shoes (see How To Shop For Running Shoes for a start). But there isn't very much information out there about good watches for runners. This watch review (of the Timex Ironman Triathlon Sleek 50 Lap Watch) tries to get that information out to all my running buddies out there. Indiglo Night-light with Night modewhich means you can either hold the button down while you look or set the button to keep the light on for a few seconds every time you push it. 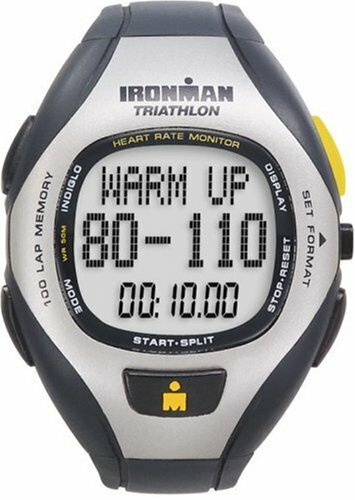 2 interval timers which allows runners to have timers that, for example, beep for your 3 minute run and then your 1 minute walk and then repeat. This feature is a must have for run/walk or walk/run runners. 100 hour Chronograph with 1/100 second resolution so you know how long your run was down to the 1/100th second. 3 Alarms: Daily, Weekend, Weekday which allows you a wide variety of alarm settings. The only negative aspect to the features of the Timex Ironman Triathlon Sleek 50 Lap Watch is that I didn't use nearly as many as I paid for. This watch is seriously comfortable. At least, it was for me and several of my running buddies. I wore it 24 hours a day for well over a year with no problems. (Since then I've stopped wearing a watch except during races and the occasional run where I need the interval timers.) When I wore this watch, I really got used to it quickly and, then it felt like I wasn't wearing a watch at all. This is apparently because it's resin strap is very flexible. The Timex Ironman Triathlon Sleek 50 Lap Watch lasted perfectly (for me) for about 2 1/2 years. At that point it started fogging up (so that you couldn't see the numbers anymore). This seems to have been triggered by jumping off a cliff into a lake (even though the depth of the lake was within the 100 meters of water resistance the watch claims to have). However, before it broke, I had taken it swimming, canoeing, snowboarding, and more with no problems. I can still use the watch, but it can be difficult to read now. Of course, after 2 1/2 years without any problems I bought another one, but have since had the same problem with it. However, I still believe this to be one of the best watches available to runners for a reasonable price. That leads us right into price, doesn't it? For me, price was the most important part when I am buying a watch. (Basically, I want a comfortable, low-priced watch with interval timers and some water resistance.) This Timex watch fulfilled those needs, including the low price. I've seen it around the internet in the $40 price range and the Timex watch homepage is selling them for $55-60. I bought mine at a chain sports store in the area for $25. In fact, I got that price both time that I bought one. So, be sure to comparison shop before you buy. The "Compare Prices" link on this webpage is a good place to start. I've seen it from $25-55 on there, so it's definitely worth a shot.